Anybody can contract periodontal (gum) disease if they don't brush and floss every day. Inadequate hygiene allows a thin film of disease-causing bacteria and food particles called plaque to build up. But while we're all at risk for gum disease, some people are more so. This is especially true for those with diabetes, heart disease or other systemic conditions. The common denominator among all these conditions is inflammation, the body's defensive response to disease or injury. When tissues become infected or damaged, the body causes swelling at the site to isolate the affected tissues, clear out diseased or dead cells and start tissue repair. Inflammation also produces redness, pain and, particularly with gum tissues, bleeding. Inflammation is an important part of the body's ability to heal itself. It's possible, though, for the inflammatory response to become chronic. If that happens, it can actually begin doing more harm than good. We're learning that chronic inflammation is a factor in many systemic diseases. For example, it can interfere with wound healing and other issues associated with diabetes. It also contributes to fatty deposit buildup in arterial blood vessels, which can lead to heart attacks or strokes. And in gum disease, chronic inflammation can cause gum detachment, followed by bone and tooth loss. We're also learning that inflammation can create connections between these various health conditions. 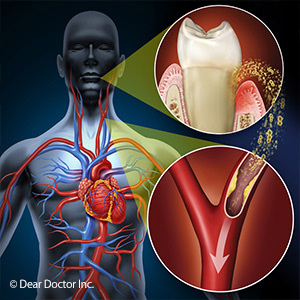 If you have an inflammatory disease like heart disease or diabetes, your risk for gum disease not only increases but it may also be difficult to bring under control. Likewise, if you have persistent gum disease, the associated inflammation could aggravate or even increase your risk for other systemic diseases. Researchers hope continued discoveries about the interrelationship of inflammation with various conditions will lead to better treatment strategies, including for gum disease. In the meantime, getting prompt treatment for any inflammatory condition, especially gum disease, could help your treatment prospects with other conditions.